Welcome to Scotland's unique cruising experience, with its network of canals and lakes including the world-famous Loch Ness. Amazing mountain scenery and Highland villages await as you cruise through the peaceful landscapes. 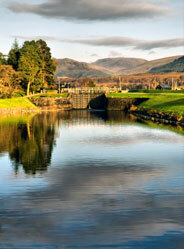 Opened in 1822, the Caledonian Canal is one of the most fascinating waterways in Europe. It was built to provide a short cut between the North Sea and the Atlantic Ocean, avoiding the hazardous Pentland Firth on the north coast of the Scottish mainland. The sixty mile long Canal takes you through Loch Ness and the Great Glen. On the great stretches of open water you are never far from sheltered moorings, and the short canal stretches are full of variety with only 10 locks, all operated by keepers. This waterway offers you rugged grandeur and plenty of space, plus all the benefits of thriving townships and Scottish Highlands hospitality. 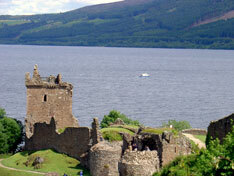 There are many piers, jetties and mooring places along Loch Ness and the Great Glen. Most are free of charge. The hotels and pubs welcome boating visitors and there are well-stocked shops at villages plus the full services of the larger towns. Fort William and Ben Nevis, Britain's highest mountain, is at one end of the Great Glen, and Inverness with its imposing castle is at the other. South of Inverness at Drumnadrochit the Loch Ness Monster Exhibition is worth a visit. From Fort Augustus the canal twists through the tree covered shores of Loch Oich to Loch Lochy and the West Highland Sailing base at Laggan Locks. Further south is Banavie, and the scenic West Highland Railway line. Angling and game fishing, eagle and osprey spotting, walking and climbing, pony trekking and sightseeing can be enjoyed, as well as monster tracking in the most famous lake in the world - Loch Ness. 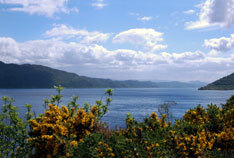 Stretching for 23 miles, Loch Ness is the largest lake in Britain. As the cruising range is restricted to non-tidal waters between Inverness and Fort William, previous boating experience is not essential. Today's canal traffic is mostly cruisers, but you may see oceangoing yachts, fishing boats or a naval vessel. Holidays in the UK has two boat bases on the Caledonian Canal, at Inverness in the north, and Laggan Locks at the midway point of the lock. 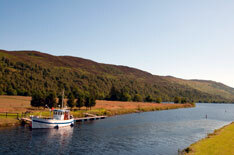 Both bases offer modern cruiser boats, with yachts also available at Laggan.